For those of you who are considering purchasing a 5th wheel trailer as your new home on wheels, whether as full or part timers, look closely at a very important aspect of the floor plan. Many models have the master bedroom up front over the fifth wheel. Just aft of that at the top of the steps is the bathroom. Yesterday at a local RV Expo we toured several mid level models and found one potentially dangerous problem with this layout. The bathroom door is located at the very top of the stairs, which leaves you no place to stand at the top of the stairs to swing the bathroom door open…where it swings out into the short narrow hallway between the steps and the bedroom door. If you or anyone sharing residency in the rig, that has mobility, balance or coordination issues this could result in a potentially serious fall from the top of the steps to the main floor level. So when you are out investigating floor plans, check the space and ease or difficulty of entry into the bathroom as it relates to the space between the stairs and the swing of the bathroom door. Try entering the bathroom from both directions, from the bedroom and from the main living area. Look ahead into the future, how will this impact your life as you age and mobility becomes more difficult. You may find that you might want to either look at upscale 5vrs or find a floor plan where the bathroom is located on the main level not at the precipice of the steps. 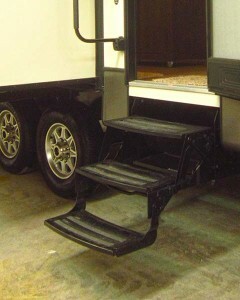 Speaking of stairs, another point is that the main floor of a trailer sit high off the ground requiring steep entry stairs. 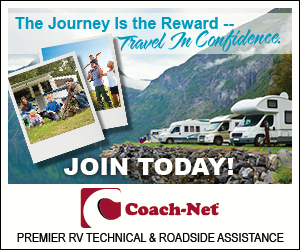 Again this is a something you must consider when deciding what type of RV meets your (don’t forget your pets*) needs. Motorhomes with air suspension offer the ability to drop the entry height requiring fewer steps. *Many of you have animals which require assistance getting in and out of vehicles and RVs. You need to take in consideration their needs as it pertains to your abilities to deal with steep stairs and the ability to open/close doors while standing on those entry steps. The right choice now means a happier and safer future tomorrow.